Izzy Eats: The art of raising a gourmand, one bite at a time: A Field Trip For Ice Cream?? As an end of year treat, Izzy and his class went to Torico's for ice cream. I must say that ice cream lover though I am, I did take pause at the idea of a field trip for ice cream. I generally think of field trips as a way to introduce children to something new and different and since we eat ice cream on a fairly regular basis, this hardly seemed to qualify as such. Since there wasn't much I could do about the trip, I tried take a positive outlook. Perhaps the other students were unfamiliar with Torico's and this was an opportunity to get to know the surrounding community. Or even better, maybe the kids would get a tour of the back of the ice cream shop and Izzy would decide to become a small-batch artisanal ice cream maker. In any case, Izzy chose the chocolate and he described it as not being as tasty as the hard ice cream. In fact, he claimed to have even requested the other ice cream. Of course he couldn't have another kind, which is quite understandable as everybody was eating the same thing. What is mystifying though, was the fact that, in Izzy's own words, "The teachers were allowed to have whatever they wanted." Does that seem fair to you? The teachers get the good stuff, under the assumption that most kids probably prefer soft serve anyway or are just plain clueless. Next year I vote for a "Make Your Own Ice Cream Party." More educational and tastier too! Oh and p.s. Izzy wasn't the only one to notice that the ice cream wasn't up to par. 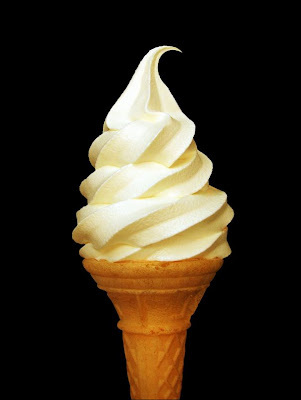 Perhaps the soft serve machine was having trouble cranking out so many ice creams.. I guess we'll never know! If I remember correctly, the ice cream they make is not really from scratch but from mix and who knows what is in that mix. I gave up on going there years ago. It seems a joke to wait in line for less than FAB ice cream when you can buy a better product from the freezer section of your favorite supermarket.